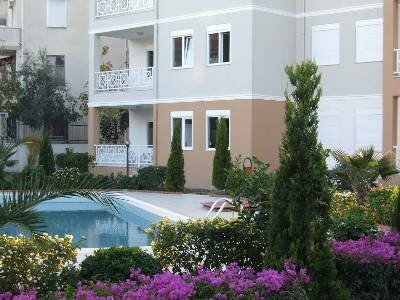 This lovely Duplex apartment is located on a small development of only 12 properties in a very quiet area in the beautiful coastal region of Side, on the Turkish Riviera. Side is only 45mins from Antalya airport. There are many shops, bars, restaurants, nightclubs and an excellent Blue Flag beach within a few minutes walk. A new pedestrian walkway along the beach opened in 2010 will take you to old Side (about 30 minutes stroll). You will love this apartment - We do! OUR RENTAL RATES ARE GREAT VALUE - TRY OUR APARTMENT, WE ARE SURE YOU WILL HAVE A WONDERFUL TIME! Our apartment is fully equipped with everything you need for a memorable holiday in the lively, family resort of Side "Jewel of the Turkish Riviera", where the sun shines for over 300 days a year making it a great place for a holiday at any time. FURTHER DISCOUNTS ARE AVAILABLE FOR OFF PEAK MONTHS!! The apartment comprises 3 double bedrooms, 2 with double beds and 1 with twin beds, There is a good sized lounge with kitchen/dining area. The apartment has 2 bathrooms/WCs. Air-conditioning keeps the apartment cool in summer and warm in winter. Television with integrated DVD and satellite channels are provided for your entertainment. There is room for 6 in the living room and dining area. There is a gas hob and electric oven, microwave oven, fridge/freezer, kettle and toaster. The apartment also contains a dish washer, a washing machine, an iron and ironing board. Cutlery, crockery, glassware and cooking utensils are all provided. All major appliances are made by Siemens. We provide all bed-linen and towels. Enjoy your sundowners on the balcony overlooking the pool. Within a few minutes walk from the apartment are many shops, restaurants and bars. Less than 10 minute walk will take you to an excellent Blue Flag sandy beach with water skiing, boat hire, wind surfing, fishing, scuba diving, A new pedestrian walkway along the beach (opened in 2010) will take you to old Side (about 30 minutes gentle stroll). Within a short walk you can catch a Dolmus (very cheap local bus service) which runs regularly to old Side or Manavgat which is great for shopping. Side Turkey is one of the Turkish Mediterraneans most attractive and popular resorts. Occupying a narrow peninsular on the sparkling Mediterranean coast, its history stretches back thousands of years. The resort is surrounded by stunning ruins, including the waterside Temple of Apollo and a well preserved Roman amphitheatre, which still hosts colourful performances. Strolling down the pedestrianized main street brings you to a harbour filled with pleasure boats and overlooked by restaurants and bars, where you can enjoy a relaxed sunset drink. The town’s long sandy beaches are some of the best on the Turkish coast and have established the resort as one of the country’s top tourist destinations. Every kind of water sport is available- or you may prefer just to laze in the warm Mediterranean sun. Side is at the centre of a beautiful and very diverse region where the Taurus Mountains descend to the Pamphylian Plain. The waterfalls on the jade green Manavgat River are another popular local attraction. Further into the pine-forested mountains, a Roman bridge spans a rushing river in the Koprulu Canyon National Park, which is one of Turkey’s premier white water rafting venues. There are plenty of other activities within easy reach, including horse riding, golf and a theme park. Many tours are available to Aqua parks, stunning mountain gorges and waterfalls in Alanya and Manavgat, Jeep safaris and many more typical holiday activities. For golfers, Belek is only 30 minutes drive from Side and has around 20 great golf courses which are amongst the finest in Turkey, and many of them are world renowned. Every year, the region plays host to a number of major international golf tournaments, including the annual Turkish Airlines Ladies and Men's European Tour Open tournaments which are played each June and November. Lymra is a small, quiet luxury development of only 10 apartments in a peaceful part of Side some owners are resident. You are only a short walk to a good selection of shops, restaurants/bars and an excellent public beach. Sun loungers and patio table/chairs are provided. The swimming pool is just a few yards from your balcony. Well maintained mature gardens.